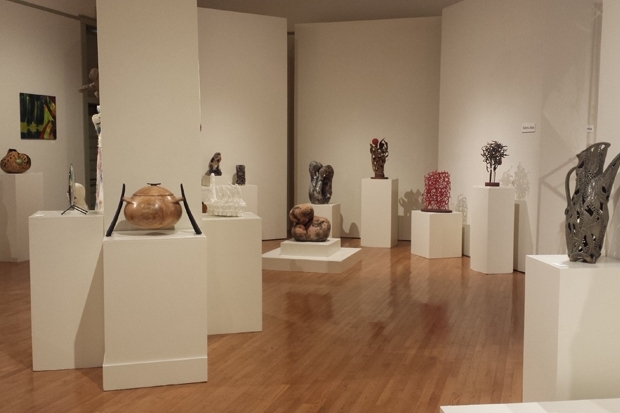 Now on view at the Honolulu Museum of Art School are three new exhibitions! Adding to the mayhem, while these exhibitions were being installed two weeks ago Fall Break Art Camp for elementary school students was in session—the noise levels reached record highs. From sacred jumping spiders to juried exhibitions to tea ceremony ceramics, there is a lot happening in the Art School this month. Here is a round up of the month’s exhibitions, all of which are on view through Oct. 31. As unlikely as it may seem, Simran is actually a dedication to Chiarello’s mother. “When I was young my mom took me outside and showed me a small jumping spider,” explains the artist. “She told me that all life, no matter the size, is sacred.” Chiarello hopes that when people look at Simran, they step back from being wrapped up in their own little webs they weave for themselves, and see that in the bigger picture, all life is interconnected and sacred. Read more about Joey Chiarello. Since 1966, the nonprofit Hawai‘i Craftsmen has worked to promote fine crafts such as clay, metal, fiber, wood, and mixed media in the art community. Through its annual juried exhibition, the organization gives local artists the opportunity to be recognized by the art community, the general public, and a professional juror. This year’s juror is craft connoisseur (and former Art in America senior editor) Janet Koplos, who served as juror for Artists of Hawai‘i in 2004. Along with the artwork selected by Koplos, as with every year, the exhibition celebrates invited artists who have significantly contributed to the Hawai‘i art community. This year’s invited artists are Satoru Abe for metal sculpture, Gail Toma for woven sculpture, and Yukio Ozaki for ceramic sculpture. The exhibition—which includes artists from O‘ahu as well as the outer islands—features works of metal, glass, fiber, wood and more. Read the Star Advertiser review. Located on the second-floor mezzanine of the Art School, cha-no-yu is a celebration of ceramics based around items used in Japanese tea ceremonies, or 茶道 (sa-dou). Cha-no-yu not only showcases the incredible ceramic works of master craftsmen, it’s also a market. Almost everything on display—tea cups, mixing bowls, sake sets—is for sale. Don’t miss an opportunity to experience and possibly take home these beautiful and functional works of art.